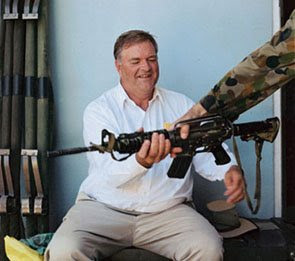 Kim Beazley a well paid loser! But instead Beazley is making adverse comments about this mans right to earn a living wage after he was detained and tortured by the USA in Guantanamo Bay. He says he does not think former Guantanamo Bay detainee Mamdouh Habib should be paid by a media company for an interview. Why? Because Beazley is a well-paid loser who thinks Australian citizens should get locked up and tortured by the US government. Meanwhile Beazley's getting paid as a well-paid loser who incidentally, never lifted a finger in Opposition to the HoWARd Government's complicity in this crime? Perhaps the police would give Mr Habib and Mr HoWARd an interview for free? The hide of Beazley to even think of denying a citizen the right to earn a living wage for his family and children while he was being tortured by the USA in Cuba! Perhaps Kim Beazley would like to donate his last three years pay to Mr Habib instead? Seems, while Beazley was putting on the pounds stuffing his face and keeping his big mouth shut about Mr Habib. Mr Habib had been taunted and profiled in Australia, then kidnapped by the US and isolated and tortured in Guantanamo Bay? Right under his nose! What did Beazley do for Mr Habib in Opposition? Agree that he should continue to be hounded and then try and make him feel uncomfortable about getting paid for his loss and suffering by telling his story. Like I said a well-paid loser! Mr Beazley says he does not agree with cheque-book journalism. "If you've got something to say to the Australian public, if you've got something to say to your fellow Australians, you walk out there and say it," he said. "You don't sit around waiting for a cheque to fall on your lap." But surely a true leader of the Opposition doesn't sit on his fat arse in denial, as our innocent citizens are being tortured in Guantanamo Bay and then taunted by the fascist government who were complicit in that torture.